I am indeed a bit of a product junkie. But I am trying to slow down on that. So far I have not bought anymore hair grease and wil just use what I got for now. Anyway I was in a store called Home Bargains. They sell branded goods really cheap. 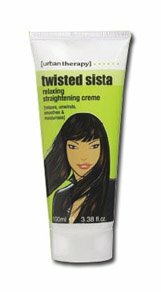 I came across a few products by Urban Therapy, their twisted sister range. One of those products was a relaxing straightening creme. I also bought their curl activator and 30 second curl spray. I have only tried the straightening creme. It feels nice in my hair and smells nice too. I just used it to blow dry my hair and then flat ironed using my FHI ceramics. I didn’t add any further products and I am pleased with the results. But we have torrential rain and I am not going outside. I went out the other day and everyone thought I had styled my hair out. I will be styling my own hair for daily wear but as you may have gathered I do not seem to be doing too well on the DIY hair styles. Even more so the hair magazines are not catering to me. Plus my young gifted hair braider is at college so I will struggle to get my hair did. Might end having to get twist extensions for winter but will see. Any style suggestions please let me know. My hair when blow dried is shoulder length or just below.